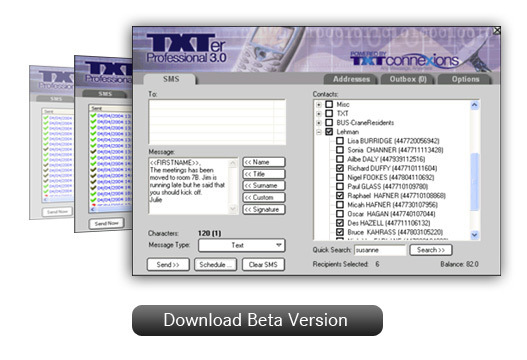 TXTer Professional 3.0 is a text messaging application. It is the perfect tool to enable you to send text messages directly from your computer desktop to customers, colleagues or friends. TXTer is currently on Beta release and was designed to enable person-to-person communication for business and individual use. TXTer can reduce your phone bill by cutting the number of phone calls you need to make. Companies will also experience an increase in productivity due to significantly less time spent on the phone. Finally, with it's 'mail-merge' functionality, TXTer can also be used for mass-marketing. Please note - for larger transmissions (of more than 5,000 messages) our support team would be happy to help manage the process for you. TXTer provides an economic way to efficiently and conveniently communicate with your customers, thus enhancing customer service and communication. Any replies to your messages can go directly to your own mobile phone, or via email to an email address of your choice. Delivery reports inform you of when your message was received, or if a number is out-of-service. Messages can be scheduled to go out on a specific date and time in the future. Support for message contatenation up to 460 characters. In other words, you can send a 'triple-length' sms message to recipients. TXTer synchronises with MS Outlook, so you only need to maintain one phone book. Mail merge features allow a high level of personalisation for texting in bulk (similar to mail-merge functionality available in most word processing applications).